Yes, you are seeing right. 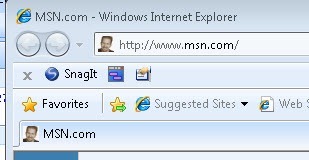 The MSN Logo was replaced by Scott Hanselman’s. From this I can only assume that Scott’s plans to become the benevolent overlord of Microsoft are proceeding well, and that he has successfully taken over the MSN division. I imagine it won’t be long then before Baby Smash becomes the primary IDE for developing C# applications. Normally isn’t the logo a butterfly? That can only lead one to deduce that there is another step of metamorphosis that we didn’t realize. Biology textbooks always show the butterfly as the higher form of life in a caterpillars journey.. Nope.. Next Stop is Scott. I’ve seen this quite frequently lately in Vista/IE7 as well. (Well, not Scott Hanselman taking over MSN…) Rebuilding the icon cache seems to work temporarily, but within a couple days it’s back to showing random icons for random web sites.